NEW YORK, New York — On March 18, an event called “Our Shushi: Remembering the Past, Longing for the Future,” organized by Armenia Fund USA and the Armenian Embassy in Washington, took place. Guests, who had gathered from around the Washington, DC Metro area, enjoyed the gracious atmosphere, wine and cheese reception, and the company of their community members who came to reminisce about their past and contribute to Armenia’s future. Participating in the event were representatives from Armenian-American organizations, members of the clergy, numerous Armenian-Americans, as well as Lincy Foundation Vice Chair and United Armenian Fund President Harut Sassounian, and the Executive Director of the Armenian Assembly of America Bryan Ardouny. 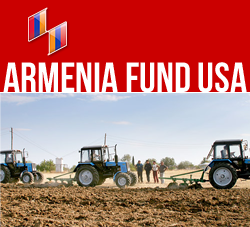 Irina Lazarian, Executive Director of Armenia Fund USA, presented the Fund’s activities, which support and invest in humanitarian programs in the educational, health and agricultural sectors. The Ambassador of Armenia to the United States Tatoul Markarian concluded the event, by expressing his gratitude to the guests and the Armenian community, with plans to meet at a similar function in the near future.